Do not twist the brake hose excessively. 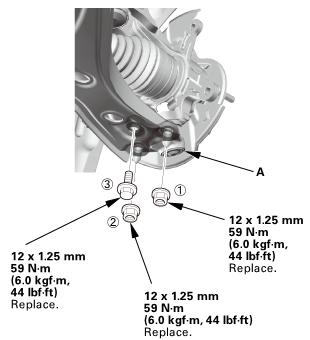 NOTE: If the brake disc is stuck to the front hub, thread two 8 x 1.25 mm bolts (B) into the brake disc to push it away from the front hub. 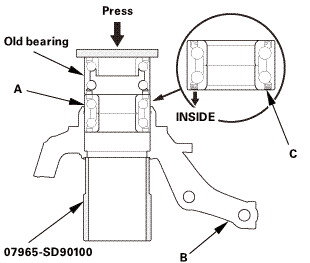 Turn each bolt 90 degrees at a time to prevent the brake disc from binding. 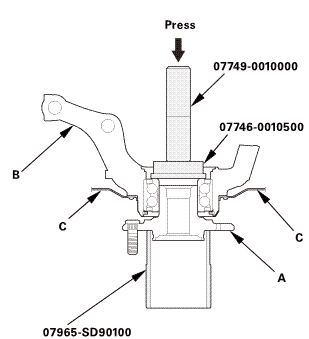 Remove the cotter pin (A). 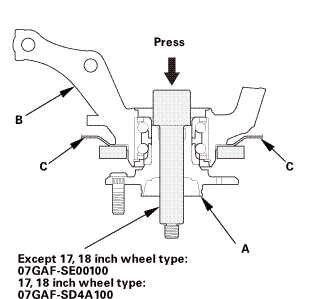 Remove the damper pinch bolts (A) and the flange nuts (B). 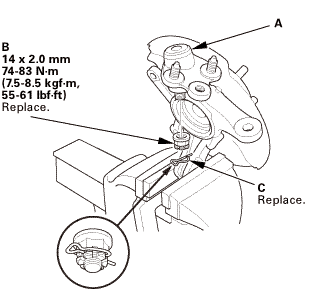 Pull the knuckle (C) outward, and separate the outboard joint (D) from the front hub, then remove the knuckle/hub. NOTE: Do not pull the driveshaft end outward. 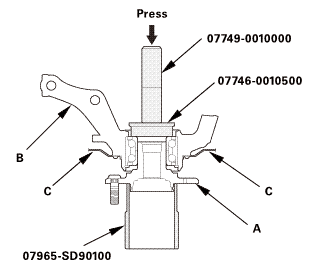 The inner driveshaft inboard joint may come apart. Remove the lock pin (A). 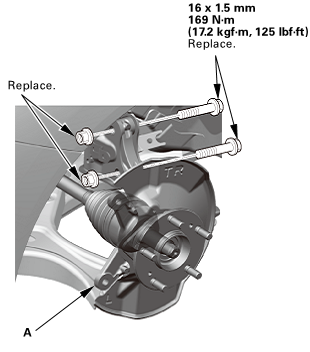 Remove the lower ball joint (C). 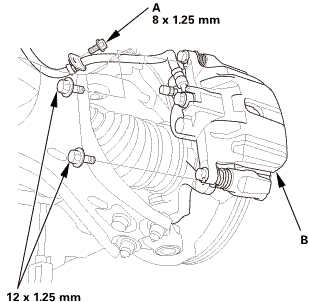 Separate the hub (A) from the knuckle (B). 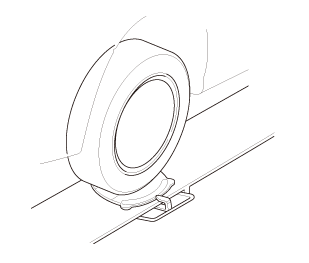 NOTE: Be careful not to damage or deform the splash guard (C). 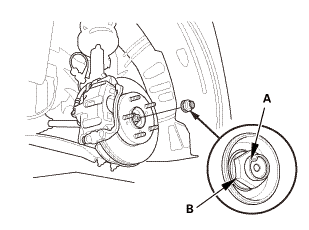 Press out the wheel bearing inner race (A) of the hub (B). Remove the splash guard (A). 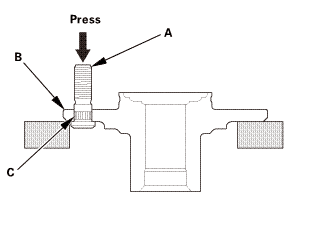 Remove the snap ring (B). 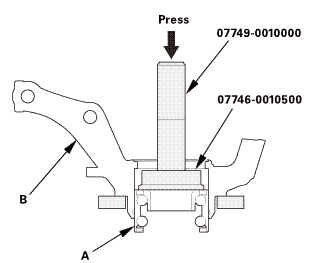 Press the wheel bearing (A) out of the knuckle (B). 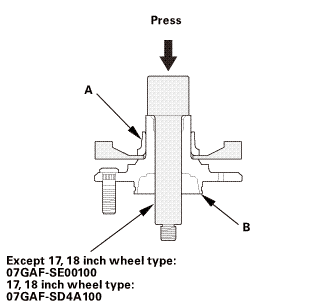 Separate the wheel bolt (A) from the hub (B). 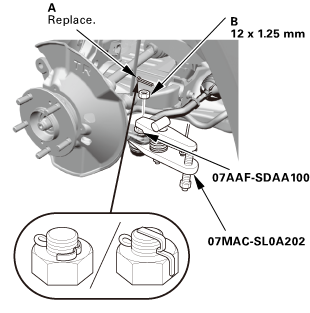 NOTE: If you cannot tighten the wheel nut to the specified torque when installing the wheel, replace the front hub bearing unit as an assembly. 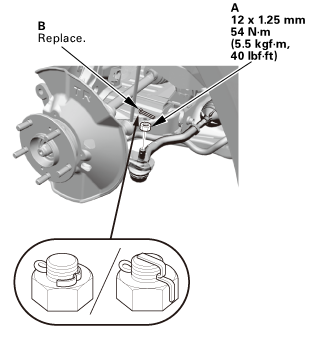 Insert the new wheel bolt (A) into the hub (B) while aligning the splined surfaces (C) on the hub hole with the wheel bolt. 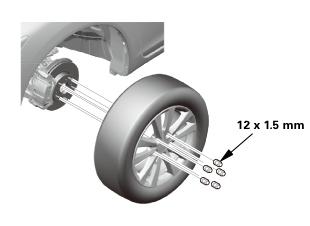 Degrease the area around the wheel bolt. 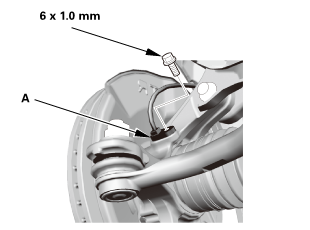 Make sure the wheel bolt is installed vertically to the hub disc surface. 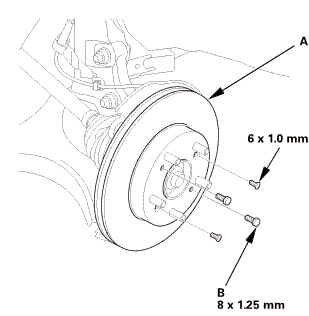 Before installing the new wheel bolt, clean the mating surfaces on the bolt and the hub. Install the wheel bolt using a hydraulic press until the wheel bolt shoulder is fully seated. 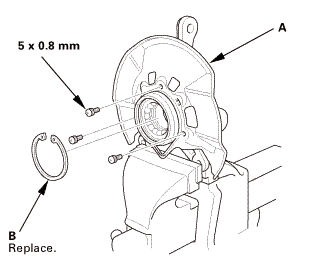 Wash the knuckle and the hub thoroughly in high flash point solvent before reassembly. 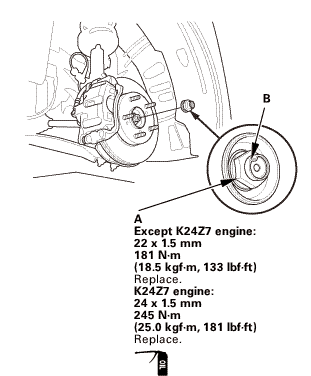 Press a new wheel bearing (A) into the knuckle (B). 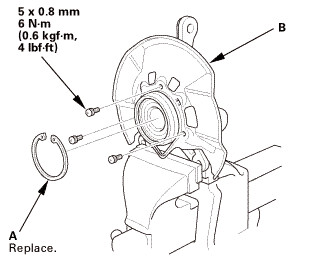 NOTE: Install the wheel bearing with the wheel speed sensor magnetic encoder (C) (brown color) toward the inside of the knuckle. 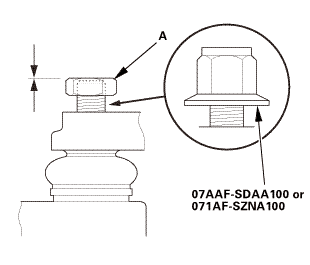 Install the new snap ring (A). 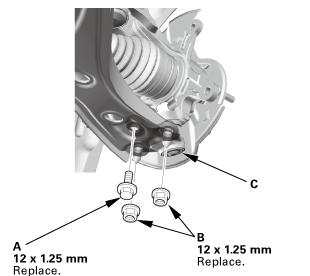 Install the splash guard (B). 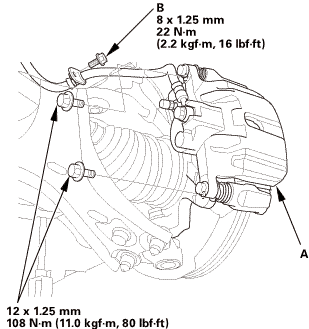 Install the hub (A) onto the knuckle (B). NOTE: Be careful not to damage the splash guard (C). 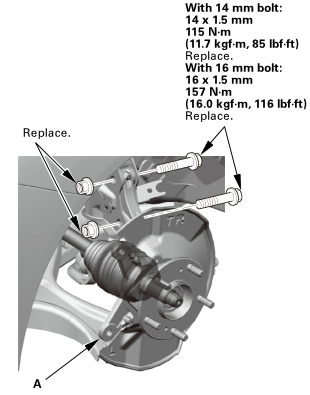 Install the lower ball joint (A). Install the new castle nut (B). NOTE: Torque the castle nut to the lower torque specification, then tighten it only far enough to align the slot with the ball joint pin hole. Do not align the castle nut by loosening it. 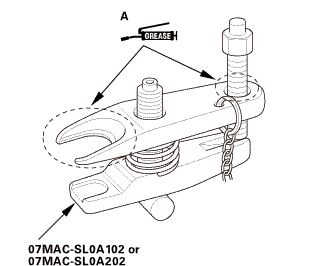 Install the lock pin (C) as shown. 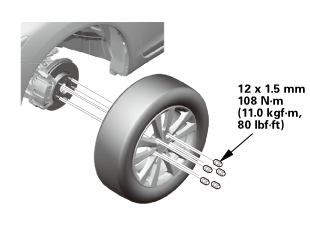 NOTE: Apply grease to the mating surfaces of the wheel bearing and the driveshaft outboard joint. 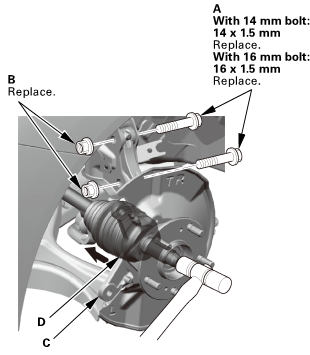 Connect the tie-rod end ball joint. 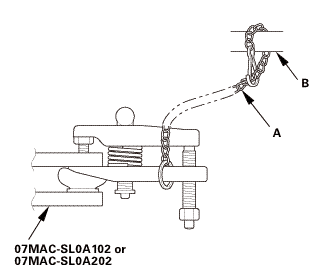 Install the cotter pin (B) as shown. 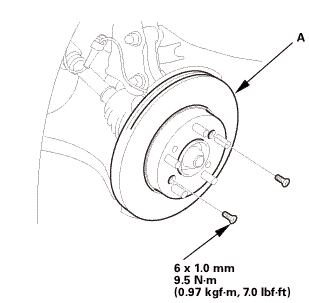 NOTE: Before installing the brake disc, clean the mating surfaces between the front hub and the inside of the brake disc. 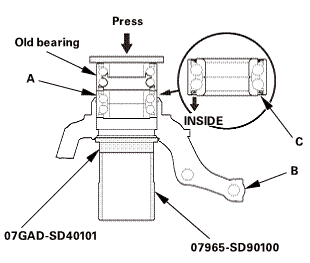 Install the wheel speed sensor (A). 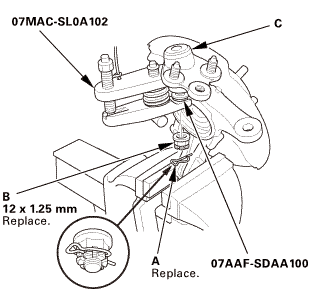 Install the brake hose mounting bolt (B).